2. Walk down Great Tower Street/Eastcheap to Monument, if you have the energy walk to the top and drink in the view. 3. Cross over London Bridge and walk through Borough Market and get some of the many free samples. While you are there check out the Shard, a stunning bit of architecture. 4. Continue down the river past the Golden Hinde and the Globe until you reach Tate Modern. Even if you don’t want to see the art, it is worth going up to the third floor and check out the amazing view of Millennium bridge and St Pauls (above). 5. 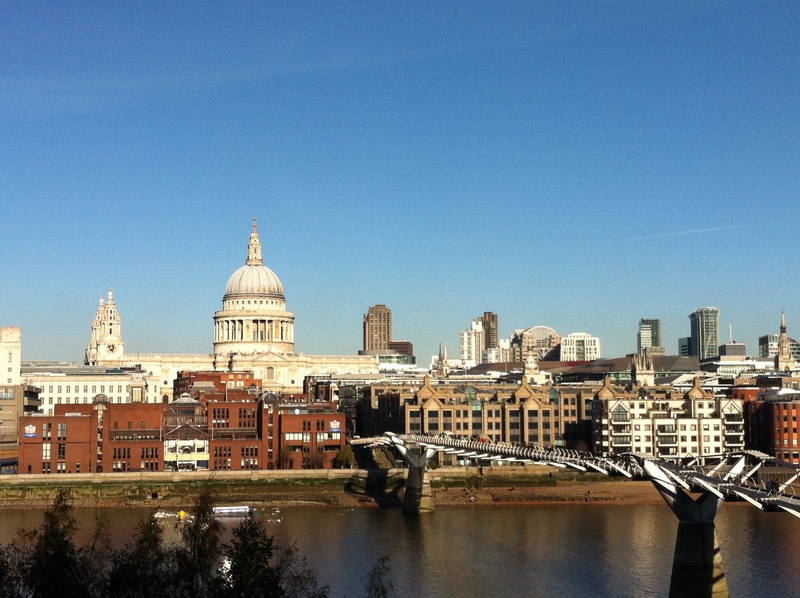 Then walk across Millennium bridge and take a walk around the gardens of St Pauls. 6. Walk along the Victoria Embankment until you get to Embankment tube, then head up to Trafalgar Square. 7. From here, you can take in the National Gallery, get an amazing coffee at Notes of Music and Coffee, walk to Covent Garden, see what market is on over at Southbank or continue on to Westminster to see Parliament and the Cathedral. Oh and the Parks (St James and Hyde) are super close to.